Powers/Abilities: Abraxas had vast cosmic powers, allowing him to traverse through and even manipulate alternate universes with relative ease. His very presence caused reality anomalies to occur. He could manipulate energy on a godlike scale and could restructure matter at whim. He also possessed godlike strength and durability. (Fantastic Four III#48 (fb) - BTS) - The being known as Abraxas was born within Eternity itself, a being a pure destruction to match Eternity's representation of creation. (Marvel Encyclopedia Vol. 6: Fantastic Four - Abraxas entry - BTS) - Abraxas' desire for destruction and power was kept in check as Eternity created a Galactus in each universe. (Fantastic Four III#48 (fb) - BTS) - When Earth-616's "first" Galactus died, the multiverse became unhinged, creating a cosmic imbalance that allowed Abraxas free reign of the multiverse. He quickly set about killing the Galactus in each universe, growing in power with each death and recruiting the Nova (Frankie Raye) in each universe as his herald. (Fantastic Four III#46 (fb) - BTS) - Abraxas laid waste to Earth-1462 and killed Earth-1462's Galactus, taking Galactus' herald Nova as his own herald and sending the severed Galactus skull to Earth-616 as an announcement of his impending arrival on Earth-616. He then began using the skull as a homing beacon, tracking it to create a path straight to Earth, where he was seeking the Ultimate Nullifier weapon. 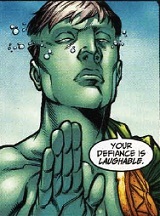 Abraxas' actions were witnessed precognitively in Franklin Richards' dreams. (All-New Official Handbook of the Marvel Universe A-Z#1 - Abraxas entry - BTS) - As Abraxas neared Earth-616, the walls of dimensional space blurred, causing numerous reality anomalies. (Fantastic Four III 2001 Annual/Fantastic Four III#46 (fb)) - As reality anomalies happened all over Earth-616, Abraxas revealed himself amidst a pile of alternate reality Galactus carcasses to Mr. Fantastic and "Earth-22519"'s Dr. Druid. Upon returning to Earth-616, Druid and his Law Enforcement Squad disappeared and the words "I am coming" appeared in the sky in flames. (Fantastic Four III#46) - Strange events continued to occur on Earth including extradimensional, microbial mist that swept through New York City, affecting the minds of some of the populace, stirring them into panic and apocalyptic rants. The Fantastic Four were soon informed by the Starcore space station that a strange meteor shower seemed to be maneuvering itself around the solar system, suggesting a sentience and provoking Mr. Fantastic to continually monitor the strange anomalies. Earth-1462's Nova (Frankie Raye), who had allied with the Fantastic Four, informed them that the anomalies signified Abraxas' impending arrival on Earth-616 and further explained that Abraxas was drawn to realities that contained a large amount of alternate reality beings. When Nova continued to explain that Abraxas would not rest until he had destroyed all alternate reality beings, Franklin Richards chimed in that he had been dreaming of Abraxas, whom Franklin called the "Dark Man." Upon gathering together some of their most powerful heroic allies, the Fantastic Four met in the now-comatose Watcher's home on the Blue Area of the Moon, where Mr. Fantastic explained the situation to the other heroes. Deducing that Abraxas had used the Galactus skull as a homing beacon to navigate his way through the multiverse, Mr. Fantastic explained that the Watcher's home might end up being the location of Earth's final stand against Abraxas. Shortly thereafter, the "sentient meteor shower" that Starcore had earlier reported made its way to the moon, where it was revealed as a group of Abraxas' soldiers. The soldiers immediately began fighting the heroes, thinking of them as "fresh meat." During the battle, microbial mist also covered many of the combatants, prompting Mr. Fantastic to request that Moondragon use her telepathy to discern their enemies' agenda. Learning that Abraxas' soldiers were after the comatose Watcher, Mr. Fantastic had the Silver Surfer shunt Uatu into another dimension in order to save the Watcher. When the Surfer did so, the microbial covered him, burning the Surfer until there was nothing left. The soldiers then focused on the Human Torch, who was rescued by Earth-1462's Nova before the heroes defeated the soldiers. With the soldiers defeated, the microbial mist swirled around, revealing a taunting, smiling image of Abraxas himself. The image then dissipated, leaving the heroes to wonder why the soldiers had focused on the Human Torch. Moondragon quickly read Johnny Storm's thought, learning that Johnny knew the location of the Ultimate Nullifier. Realizing that Abraxas must be seeking Earth-616's Ultimate Nullifier and they needed to beat him to the weapon, the heroes learned from Captain Marvel's cosmic awareness that Uatu had hidden the Nullifier in one of three locations, if not all three simultaneously. Returning to the Baxter Building, the Fantastic Four used Mr. Fantastic's mental projection helmet to map out the three possible locations of the Ultimate Nullifier and the Human Torch set out with Earth-1462's Nova to seek the Nullifier. As the rest of the Fantastic Four disappeared into time and space on their own mission to find the Nullifier, Abraxas appeared at the Blue Area of the Moon, where he melted some of the stone architecture and spoke the words "Veni, Vidi, Vici." (Fantastic Four III#47) - Abraxas arrived on Earth in New York City, causing massive reality anomalies including Earth-11147's Curly Howard as mayor of New York City, Earth-47366's John Lennon alive and well, "Earth-14447"'s Nazi stormtroopers invading New York's diamond district and other alternate reality inhabitants to appear on Earth-616. The Fantastic Four's ally Marvel Girl watched events unfold from the Baxter Building and as soon as she turned to get Franklin Richards, she found herself face-to-face with Abraxas. Before Abraxas could destroy her, Marvel Girl time-jumped. She emerged to find Namorita in her water-breathing Kymaera state and while Marvel Girl tried to help the suffocating Namorita, Abraxas knocked on the walls outside, speaking the "Three Little Pigs" nursery rhyme. By the time Abraxas entered the room, Marvel Girl had time-jumped once more, leaving Abraxas to look at Namorita and determine she was not Marvel Girl. (Fantastic Four III#48) - Having time-jumped with Franklin Richards to the omniversal guardian Roma's headquarters, Marvel Girl learned of Abraxas' origins from Roma as Abraxas' presence near Earth continued to cause reality warps on Earth-616. When the Human Torch and Earth-1462's Nova eventually found the Ultimate Nullifier, Nova revealed her alliance with Abraxas and attacked the Human Torch. Tracing Roma's signal, Abraxas teleported himself, Nova and the Human Torch into Roma's citadel, emerging from her viewscreen. Roma attempted to appeal to whatever of Eternity existed within Abraxas, who claimed that Eternity's love of Roma drew him there. Abraxas then kissed Roma, draining her lifeforce and seemingly killing Roma. Abraxas then teleported himself, Earth-1462's Nova, Franklin Richards, Human Torch, Marvel Girl and Roma's ally Saturnyne to the Baxter Building, where the other Fantastic Four members had just arrived back in their bodies after sending their consciousnesses into other realities to seek knowledge of the Ultimate Nullifier's location. Abraxas then summoned his other Nova heralds and was given the Ultimate Nullifier by Earth-1462's Nova. Abraxas then announced that with the Ultimate Nullifier, no soul on Earth could stop him. (Fantastic Four III#49) - Abraxas unleashed his army of alternate reality Novas against the Fantastic Four. While Human Torch battled Earth-1462's Nova, Mr. Fantastic attempted to rush at Abraxas in hopes of retrieving the Ultimate Nullifier from him. Unfortunately, Abraxas immediately surrounded Mr. Fantastic with a legion of alternate reality Novas. When the Thing jumped at Abraxas, Abraxas briefly froze him in place then launched the Thing several blocks away then focused his attention once more on Mr. Fantastic, whom Abraxas tortured, explaining that as Mr. Fantastic died on Earth-616, his counterparts across various realities would also perish. As Franklin Richards and Marvel Girl began to realize what was needed to defeat Abraxas, Abraxas began to activate the Ultimate Nullifier, attacking Eternity itself. Marvel Girl and Franklin join minds and used Franklin's reality-warping powers to resurrect Galactus, who retrieved the Ultimate Nullifier from Abraxas. Abraxas immediately sent his alternate Novas to attack Galactus, who gave the Nullifier to Mr. Fantastic while he defended himself against the Novas. Mr. Fantastic quickly activated the Ultimate Nullifier, destroying Abraxas, the Novas as well as the entire universe. The universe subsequently righted itself and everything was restored to normal. Abraxas had an entry in Marvel Encyclopedia Vol. 6: Fantastic Four (2004), All-New Official Handbook of the Marvel Universe A-Z#1 (2006), and Official Handbook of the Marvel Universe A-Z HC Vol. 1 (2008). During Abraxas' time on Earth-616, numerous temporal and reality anomalies occurred, bringing forth characters from different realities and time periods. Due to the temporal nature of the anomalies, it was not clear which realities the characters originated or if they even came from an alternate reality. For example, the red-haired Tom Thumb seen during the story could be a younger version of Earth-712's Tom Thumb or he could be from an entirely different reality altogether. The Destroyer, the female Doctor Spectrum, Captain Marvel (Mar-Vell), and the Thor who appear during the anomalies could be from alternate realities or they could just as easily originated from Earth-616's past or future, as there was a female Doctor Spectrum who appeared in New Thunderbolts a few short years after this Abraxas story. Some characters were confirmed to be from alternate realities, such as the living John Lennon and Mayor Curly Howard, whose reality designations were revealed in the Alternate Universes Appendix in the Official Handbook of the Marvel Universe A-Z hardcover series. Also, it was unclear if all of the displaced beings were transported back to their home realities upon Franklin Richards' restoration of Earth-616, or if they were destroyed when Mr. Fantastic used the Ultimate Nullifier. It's also possible that the beings simply appeared on Earth-616 briefly and were returned to their home realities prior to Mr. Fantastic using the Nullifier, similar to how the Law Enforcement Squad appeared then were returned to their return prior to Abraxas arriving on Earth-616. Jacob Cundiff pointed out that the alternate reality Goliath might also be an alternate counterpart to Dr. Eliot Franklin/Thunderball, given the color scheme of Earth-616's Thunderball. There's certainly nothing to prove or disprove that theory since the character was never actually named on-panel. I ASSumed him to be called Goliath, given the big 'G' on his belt (which made me also ASSume that he was Bill Foster) but it was never stated who this character actually was, so there's certainly nothing to say that he was or was not Eliot Franklin. Abraxas, of "Abraxas & the Earthman" series @ Epic Illustrated#10? An alternate counterpart of Goliath (Bill Foster) appeared on Earth-616 as Abraxas grew closer to Earth-616. Disoriented, Goliath fell backwards into a New York City building. As Abraxas grew closer to Earth-616, Curly Howard of Earth-11147, who was mayor of New York in his home reality, and some of his personal belongings was transported to Earth-616. 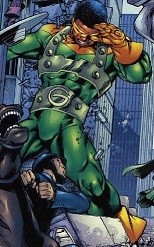 An alternate reality counterpart of Jack O'Lantern appeared on Earth-616 as Abraxas drew closer to Earth-616. The heroic Jack O'Lantern attempted to save innocent lives when an alternate reality Goliath fell into a New York City building. Alive and well in his home reality, Earth-47366's John Lennon was transported to Earth-616's Strawberry Fields Park as Abraxas grew closer to Earth, much to the amazement of New York City bystanders.